Eating locally and shopping at farmers markets for seasonally produced goods is a trend right now, in cooking and in cookbooks, but it is a trend that is slightly more difficult to take part in than you might think. It takes practice to go to the market, pick up something and bring it home and make it into a meal – especially when you’re not sure what you’re going to find when you head out to shop. 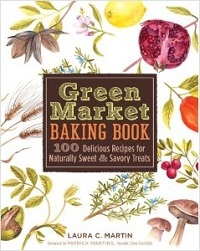 It is helpful to have a guide like the Green Market Baking Book stashed away to give you some pointers and menu ideas so you’ll know what to look for and what to make with whatever you find. While many seasonal-eating books focus on savory dishes, this one is primarily about baking, breakfast and dessert. This cookbook is dedicated to the idea of healthy eating and baking, with a focus on using seasonal ingredients found at local markets. It is set up by season, with lists of the fruits and other things that you’ll find in spring, summer, fall or winter, as well as notes about how to choose the best of the bunch. Each season is divided up into smaller sections by recipe type and you’ll find everything from savory tarts to cookies to pies. 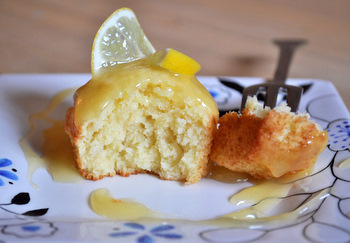 The recipes have a healthy slant and use only natural and unrefined sweeteners. Many of the recipes use whole grain or whole wheat flours. While there are a good number that still use plenty of butter and eggs, the are also many lower fat, wheat free, dairy free and vegan recipes in the book. This means that you have options whether you’re looking for a simple veggie-laden pizza on a homemade crust, a decadent New York Style Cheesecake made with agave syrup or a Vegan Mexican Chocolate Cake. 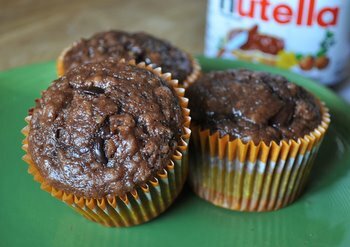 Many of the recipes in the book have been contributed by well known chefs, such as Alice Waters, or have been adapted from popular bakeries and cookbooks to be a bit healthier. One of the most interesting sections in the book comes at the beginning, where the author compares “traditional” recipes to the Green Market Baking versions, explaining how she was able to make substitutions for white sugar and other ingredients and still get a great finished product. While you’ll have a lot of appealing recipes to choose from in the 100+ included in the book, it is the substitution tips in this section and throughout the book that will enable you to experiment a little more with your own baking, make use of seasonal ingredients and even come up with some of your own signature desserts. I will definitely be checking this book out. I love hearing about new baking books, especially ones that focus on being a little bit more healthy. Thanks for sharing.